A silent, peaceful but visually forceful manifestation at the Parliament in Stockholm, and maybe more cities around the world if we succeed. 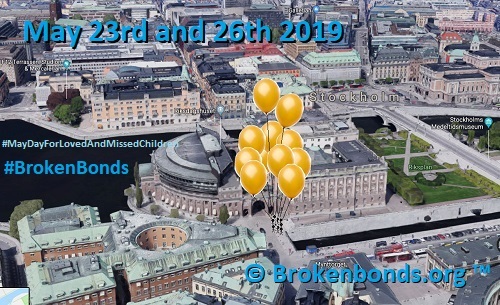 Every missed child will be seen represented by a golden balloon! - and their lost relationships. Visualize and rise attention to the extent of this national trauma and the affected children in Sweden (and the world). And the number of close relationships affected. Pay attention to the fact that there are no functions or bodies in society that have the mission or the right skills to drive this issue, or where neither children nor afflicted relatives can turn - now or later in life when trying to get their lives together in the consequences of this. To clarify, with a few simple and clear measures, the cost to society for this national trauma. Both when the conflict begins, and then lifelong through consequences of different kinds for the child. We have started collecting data to be able to show this. It is time to raise awareness of the uncomfortable, sad facts about the affected children. - COOPERATION IS THE KEY - The specificity, focus and driving force of various initiatives in this matter must be taken into account. 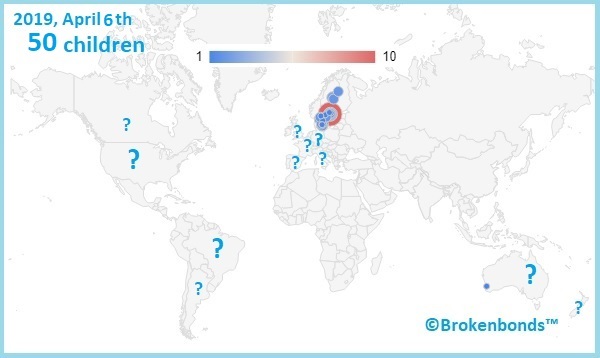 Brokenbonds / Missing is based on the thesis that "You can change a system by fighting the system itself" - the idea is therefore to try to find new approaches. It is not meant that this should copy any other initiative. The ambition is to consciously try to think outside the box regarding methodology,problem formulation, etc. And with this as a base work closely with other initiatives with the same or similar goals. Here soon strategy, activities, partners etc. will be presented. - Strict "factual orientation" as a basis - avoid traps such as fears and emotions - which are good sometimes but which in this initiative just pulls focus away. - This is about childs life being ruined. We have a conscious constant vigilance NOT to end up in the "war between sexes/genders" or in the political polarization - if this lifted there are forces that want to take us there. - As mentioned, "You can change a system by fighting the system itself" - the idea of this is to try to find new approaches. It is not meant to copy any other initiative. The ambition is to consciously try to think outside the box regarding methodology, problem formulation etc. - Cooperation is the key - the specificities, focus and driving force of different initiatives must be used.